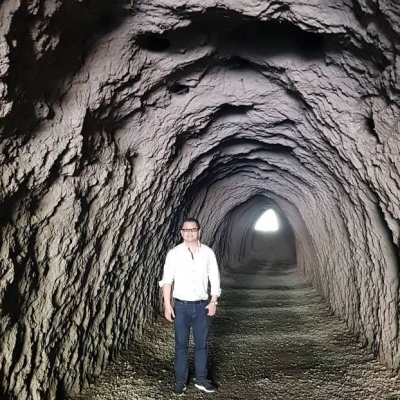 Petroglyphs and Petrographs of the Philippines is part of the Tentative list of Philippines in order to qualify for inclusion in the World Heritage List. This is where one can see the oldest work of art in the Philippines done 3000 years ago using stone tools. I visited this site on May 1, 2018 and what normally is a 2 to 3 hour ride from Manila to Angono-Binangonan in Rizal Province took me less than an hour, being a Labor Day holiday. The Waze app I used was very accurate and I suggest using this because only 5% of the locals have knowledge of this place. Ninety five percent of the visitors are out-of-townees. The site is on an elevated area, hilly, and located inside a subdivision which is privately owned. There are no public transportation inside so one has to walk a few minutes from the entrance to the site. If you have a private car, there is a parking area beside the tunnel entrance to the petroglyph. Its a 5-10 minute walk from the man-made tunnel entrance which was a little dark but cool. There is a mini museum which use to house the artifacts like flake stone tools and obsidian flakes, but has been transferred to the National Museum in Manila. There are 127 figures consisting of stylized human figures and several animals like lizards and turtles. Since President Rodrigo Duterte became president, he abolished the entrance fee, so everybody can enter free of charge. The site is well maintained with guards 24/7. My only suggestion is that the actual petroglyph should be covered or housed because weather elements will surely erase it after 100 years. One can tour the whole site in an hour. This explains why Angono is the Art Capital of the Philippines producing geniuses like Lucio San Pedro and Botong Francisco. Their ancestors have been doing art since 3000 years ago. The site is also on the tentative list of UNESCO World Heritage Sites and I hope this will be accepted by Unesco in the near future. Read more from Vicente B. Avanzado Jr. here. 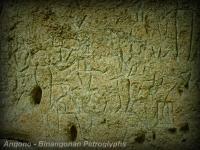 Visited the Angono Petroglyphs last month (June 2011). The site is also referred to as the oldest known artwork in the Philippines. The site is well-managed: nice landscaping, small but adequate museum facilities, a platform for viewing the petroglyphs. However, transportation to the site is a little difficult. There's been no report on public transportation so independent travel to the cave area is not really that attractive. I ended up hitchhiking with locals. Other options would be to rent private vehicles. Another issue would be the buffer zone of the site. A good part of the hill/mountain seems to be located within a private residential village. All in all, it was a very rewarding experience.